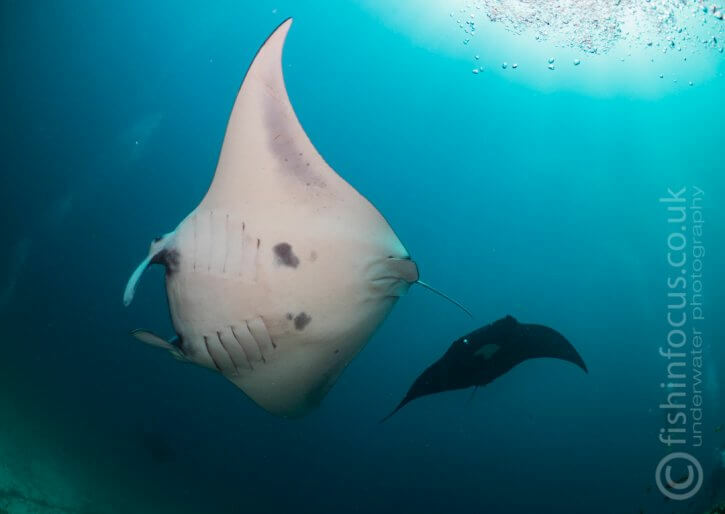 Last year, during a dive on Daedalus Reef I had one of my greatest encounters with mantas. 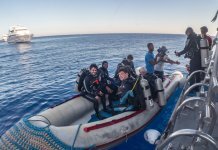 The Red Sea is not known for reliable manta encounters however during the month of May these magnificent creatures come close to the offshore reefs to feed on the nutrient-rich waters that surround these isolated seamounts. There is something magical when you go out looking for hammerheads and not one or two but about 8 mantas show up and stay around you for the entire duration of your dive. Mantas are without a doubt one of these creatures that regardless of how many times we’ve seen them are always fascinating. Closely related to sharks, these enormous fish are probably the most graceful swimmers in the sea and as an underwater photographer, they are one of my favourite subjects to shoot. Mantas are among the most intelligent fish in the Ocean and are fantastic subjects to photograph. 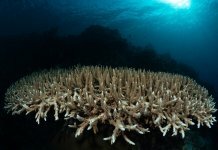 The Maldives is probably the most famous destination for divers wishing to swim with these gentle giants, but there are other places such as Komodo in Indonesia, and the Socorro islands in Mexico where you can reliably find them. 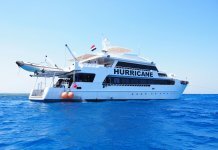 Don’t overlook the Red Sea even at the right time of the year. 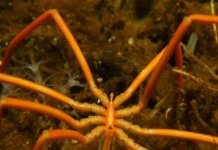 Here you can find them on the offshore reefs such as Daedalus and the Brother Islands. When it comes to manta, one of the fundamental considerations is a good wide angle lens. Being such big animals, you will need all the field of view you can get in order to get the whole subject in the frame from a reasonable distance. If I know I’ve got a high chance of seeing manta and they are likely to come close, my lens choice tends to be the trusty fisheye. But if they keep their distance, a wide angle zoom lens is much more suitable allowing me to better fill the frame. A fisheye lens allows me to capture these two mantas from a reasonable distance. 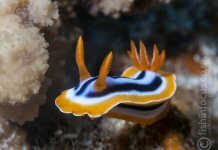 Recently I’ve been using a wet semi fish-eye lens with full zoom capabilities, but thus far, I’ve not had the chance to test it with mantas. I’m really hoping for the same manta frenetic feeding loops on my next Shark Quest photography to see how it works. Manta rays are among those few subjects that work very well from almost every angle. Head-on shots are very dramatic and can show the mouth and cephalic lobes. When trying these shots make sure you have good eye contact. But they also look great when shot from underneath or above. If a manta swims over your head you will have two options. You can create a striking silhouette by turning your strobes off and choosing a very fast shutter speed to expose for the bright background. Or if you light the underbelly with strobe, you can show the gills and markings of the manta belly but be very careful not to overexpose the white underside. Try to keep the power of your strobe low and keep them wide apart. 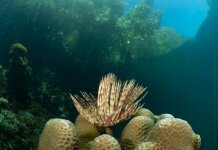 Contrary to many other marine creatures, shooting from above can yield very beautiful shots. The markings on the back of reef mantas are very photogenic and together with the shape of the fins, you can create very dynamic images. Mantas are one of the few subjects that can look great when photographed from above. When shooting close to the surface, I always try to capture the reflection, of the manta on the surface. This will help to frame your subject. To achieve good reflections ensure your camera is at a shallow angle compare to the surface and the sun is behind you so it will bounce back on the top of your subject and reflects on the water. The manta needs to be just underneath the water otherwise you wont get any reflections. 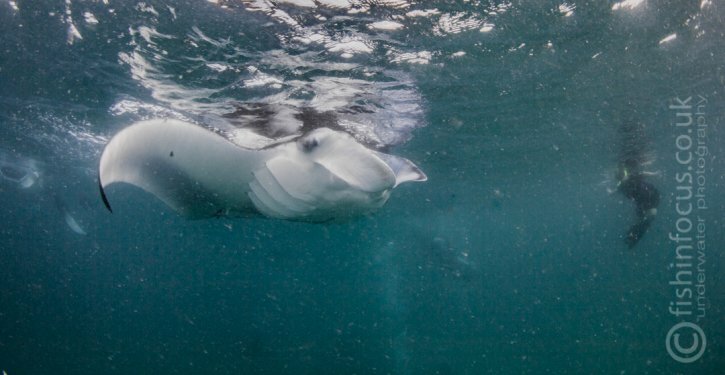 The reflection of this manta on the surface is a strong compositional element. 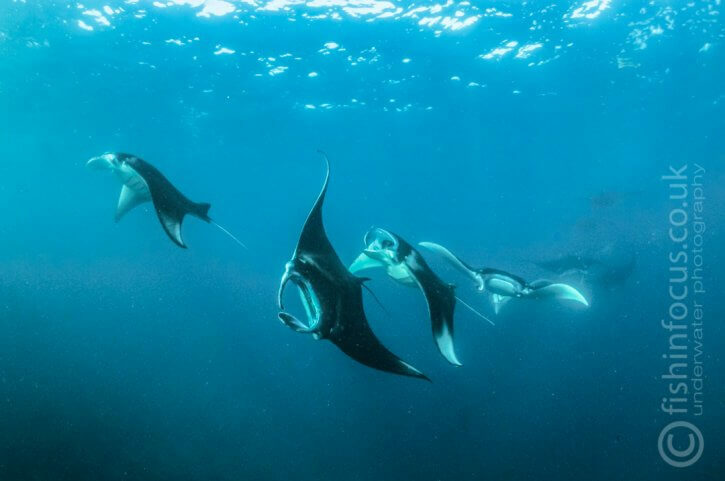 As I mentioned earlier, most of the most popular manta destinations are those where these beautiful animals congregate to feed. This is because the number of individuals we can potentially see is huge. However, for photographers, this introduces a very difficult problem to deal with: visibility. 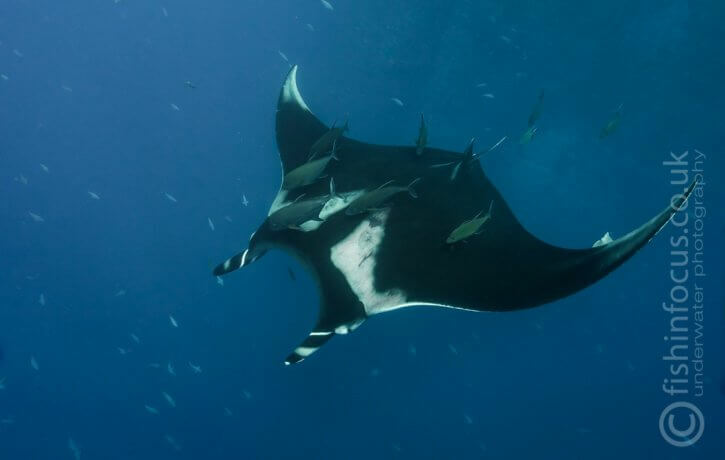 Mantas feed on plankton and if they are feeding in a specific area is because there is plenty of the stuff floating around. This will dramatically decrease the visibility and will create a huge amount of backscatter if you use strobes. To minimize these problems, shoot using only ambient light and try to stay as shallow as you can to optimize the sunlight. 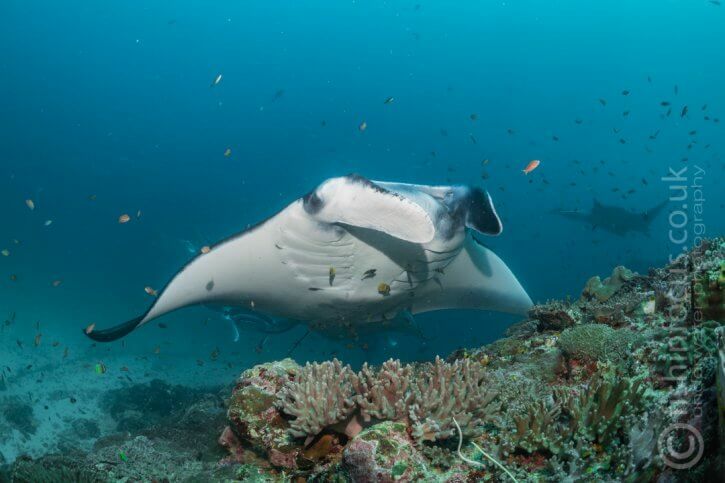 Plankton in the water will attract the mantas which feed on it but can cause an awful amount of backscatter. It is not unusual to find mantas feeding on the surface, in this case, leave your scuba kit on the boat and jump only with your snorkel. You can also ditch your strobes and arms. As I said, ambient light always works better when swimming in plankton-rich waters and your rig will be much more streamlined giving you a better chance to stay with the mantas. Increase the camera ISO, and get as close as you can to the manta to get sharper shots.. Remember that if you decide to us strobe and your subject is further away than a couple of meters, they will only illuminate the water and the plankton in it, and not the manta. A manta feeds close to the surface. 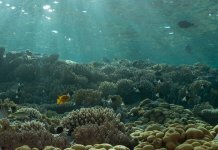 Using ambient light helps to prevent backscatter caused by the plankton in the water. As any other marine animal, mantas need regular cleaning to get rid of parasites and dead skin from their body, gills and mouth. 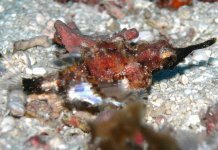 This is done by smaller fish at specific points along the reef called cleaning stations. 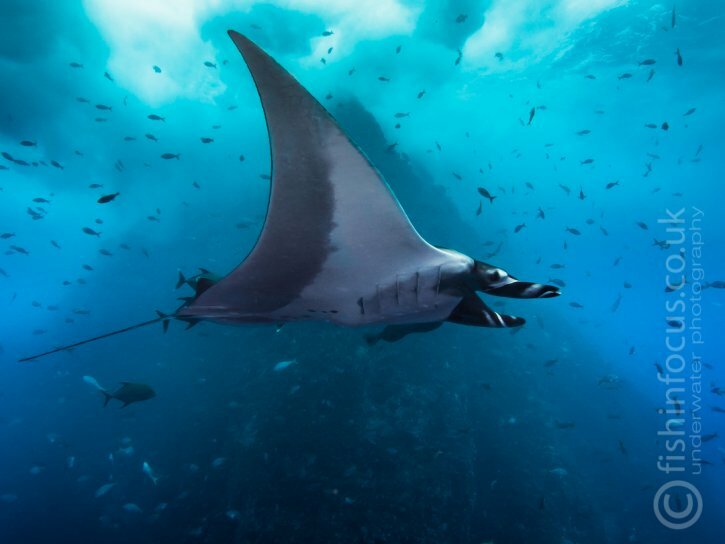 Places such as Manta Alley in Komodo or the Socorro Islands in Mexico offer reliable encounters with mantas and often less plankton in the water allowing us to photograph them without the problem of backscatter. A manta swims by at Roca Partida in Mexico. The dramatic backdrop of the underwater seamount and the rough surface gives a great level of dramatism to this shot. Approaching the mantas in a cleaning station tend to be much trickier than it is in feeding areas. You have to think about your position carefully. If you swim over the station itself all the cleaning fish will swim away and hide or try to clean you. In either case, there is no reason for the manta to stay if they won’t pay attention to it. 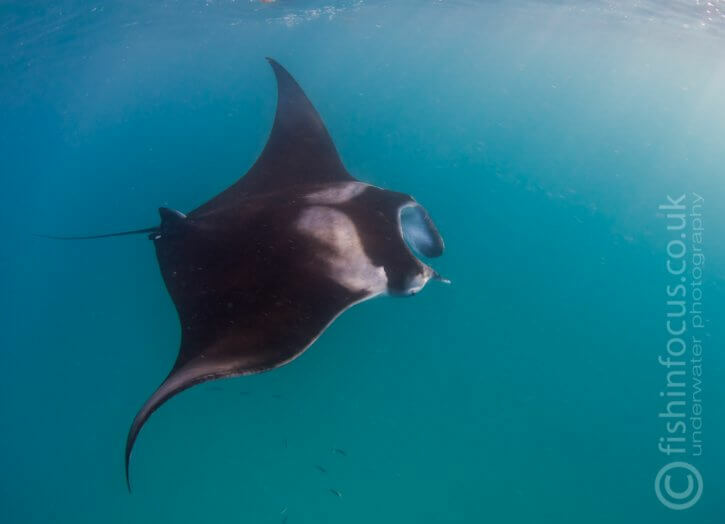 I tend to hover around the edges where the mantas normally approach or leave the station, this will allow you to get some very powerful head-on shots. 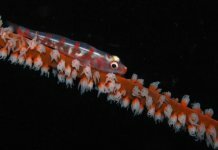 Reduced plankton in the water means that using strobes is not as problematic, but keep in mind the distance to the subject and keep your flashguns back from the front plane of the camera port to avoid hot spots. 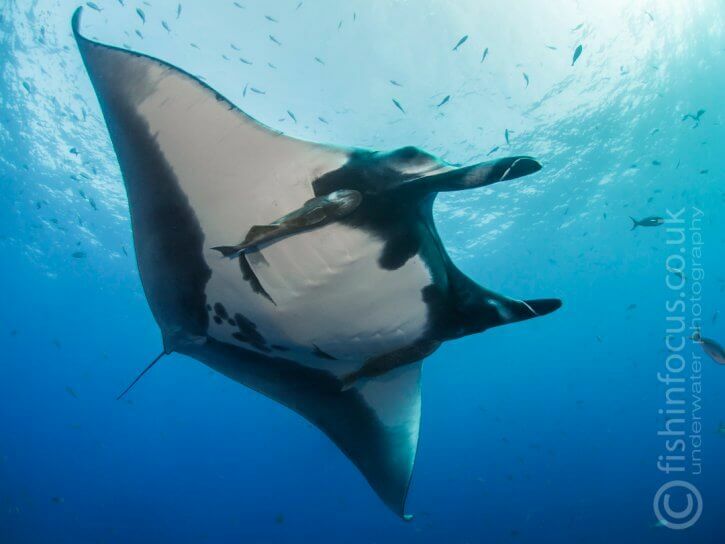 The mating ritual of mantas offers great photo opportunities. 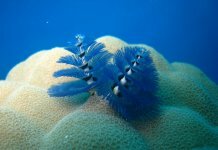 When a female is looking for a suitable partner it starts swimming in a relatively acrobatic way, males start following her and replicating all her motions. this can continue for days until only the strongest male remains and “win the right” to mate. These manta trains are fascinating to watch. 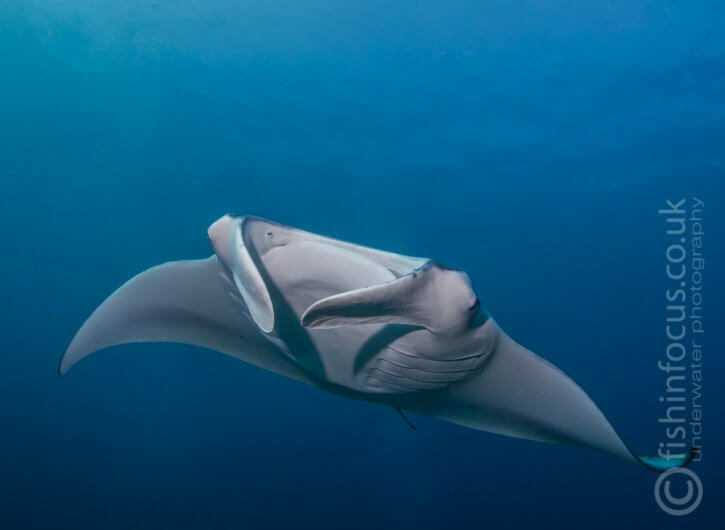 If you are lucky to witness this behaviour and want to photograph it forget about your strobes, chances are they will never light the mantas, use ambient light and a fast shutter speed to ensure you can freeze the movement. If necessary increase the ISO. A train of mantas during mating. The males will copy all the movements of the female. Join me on my next Shark Quest photography trip to the southern Red Sea for a chance to encounter some of these magnificent giants as well as hammerheads grey reefs and oceanic whitetip sharks.